The Damon system is a relatively new fixed appliance treatment that reduces the friction between the wire and bracket. This allows teeth to move more, predictably and with lighter forces than conventional braces. The Damon System is not just another brace, it's a whole new way of treating patients. Damon smiles are full, natural smiles achieved with light, biologically sensible forces which work with the body's natural adaptive processes. Damon braces are designed to be discreet, comfortable and easy to keep clean. 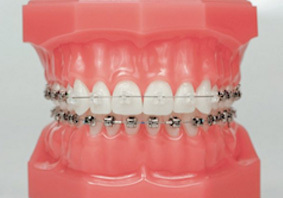 Without the elastic ties which attract and collect plaque, Damon braces also make dental hygiene easy during treatment. Damon appliances are also available as cosmetic, tooth coloured brackets which are much less visible than the metal version - Damon Clear. These are available for the upper arch only, with metal Damon brackets usually placed on the lower arch.